The Peterson Team are experienced professionals who care immensely about the success of our company and customers. We all come from diverse backgrounds and cultures. Put a face to the name by reading our short profiles below. With qualifications in Management, Marketing & Accounting, and having helped her father initially build Peterson’s for more than 10 years, Kerris knows what works for customers and what doesn’t. She and her husband Chris Browne,have built their own company from the ground up, expanding Peterson’s range and creating a brand that is synonymous with high quality, reliable, functional and innovative machinery. Kerris enjoys running the sawmills and building various projects around the farm with the resulting timber. 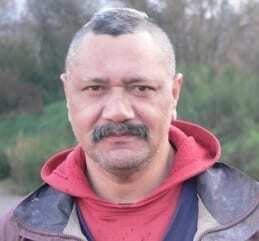 Kerris spent her younger years in the jungles of Fiji, but the family was eventually forced to flee to New Zealand in 1987 due to a Military Coup. Marrying local “kiwi” boy Chris Browne, they have successfully built both a business, and a family with two children. The entire family is often seen at various sporting events on weekends. Kerris enjoys her annual road Marathon around the Lake, running ultra-marathon events in the local forests, and the odd triathlon when she can find time between businesses, family, farm, and her community coaching roles. 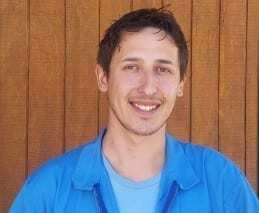 Aaron is the Senior Mill Consultant, having worked here since 2006. 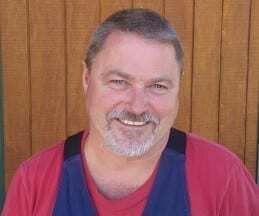 He has worked in the timber industry for more than twenty years and brings a wealth of industry knowledge to Peterson’s. Before he started with the company in 2006, his previous industry work experience included timber machinist, grinding room technician, and Manufacturing Coordinator. Away from Peterson HQ, Aaron enjoys spending time with his family in the world famous Redwood mountain bike trails, and supporting his 2 athletic teenagers at hockey and rugby tournaments. When he’s not working around their rural property, Aaron will be out hunting, fishing, camping, trail riding – anything to do with the outdoors! 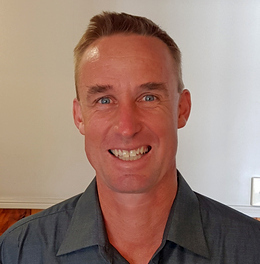 The great outdoors, beautiful lakes and great trout fishing, were some of the reasons Greg moved to Rotorua in the early 1990’s. He has been a banker, sports good retailer and specialised engineering client manager. Greg is strongly focused on customer care to provide the best support to all our customers. He works with Aaron in the Sales office, handling new enquiries, and working with Peterson agents all around the world. Greg and his family enjoy living in the country, with expansive views of Lake Rotorua and the city. When he gets time, Greg loves to chase the huge trout in our many lakes. Visitors to Rotorua often lure him out, so if you are coming to Peterson HQ and want to catch the big one … Greg would be keen to join you. Tim joined the Petersons team in 2018. Tim’s primary role is to look after existing Petersons agents around the world, and facilitate new agents into the Peterson business. This is Tim’s first role in the foresty industry, having previously been a physical therapist, IT technician and CCTV salesperson. Tim and his family moved to Rotorua in 2013, attracted by the outdoor lifestyle and everything else that Rotorua has to offer. Tim’s focus outside of his work at Peterson is his family, wife Sonja and two primary school children Alfie and Nina. You can often find Tim in the forest with family or friends, exploring, mountain biking or running. 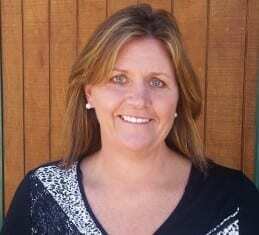 Joyce has been with the company since 2001, and rejoined the Peterson team in 2012 after a six year absence. Once you have purchased your mill, Joyce takes charge to ensure your Peterson mill gets to you in good time, and in good condition. Joyce is the person you deal with when ordering a sawmill, and she will look after everything from transit insurance, payment details, and sending you an operating and maintenance DVD with your new mill. 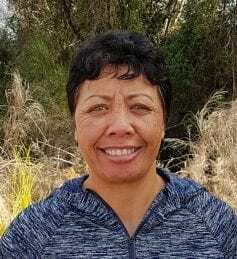 Joyce was born and bred in Rotorua, and although she enjoys traveling, has not yet found anywhere else she would like to live. 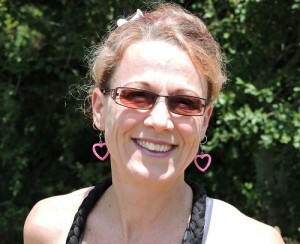 In her spare time Joyce likes to spend time with her family and friends and likes to relax with a good movie. Marama has been with Peterson’s since 2001 and works tirelessly, always willing to help others, and always wearing a smile. Marama happily juggles her job with three daughters, a son, a husband and three grand children. Three of her adult children have their own homes and families, but there seem to be gatherings at mum-and-dad’s whare most weekends. If Marama wants to do something for herself, she goes for a run in the forest with her “running family”. Her name means ‘moon’ in her native New Zealand and if you were wondering how to pronounce it, she says, “How does a lamb go? Baa, baa. Well, for me, it’s Maa-ra-maa!”. Rachel is Chris Browne’s older sister. She’s a local lass who spent a good many years of her life with the local fishing goods manufacturer, Kilwell Sports. After a brief stint in Australia with her grown daughter, Rachel returned to the greener hills of Rotorua and her fabulous partner Tony in 2014 – it may have helped that he is a great fisherman! Rachel initially began on a part time basis with Petersons. However, now she is in hot demand dealing with all your small parts sales and dispatch, as well as accounts administration. In her spare time Rachel can be found with a glass of Sav and a fishing rod in her hand. This month she’s been a prize winner in both her sports: a spot prize of garden furniture in the Redwoods off-road running event, and a huge trophy – too big to fit in the house – for “best condition” in the Lake Rotoiti trout fishing competition. 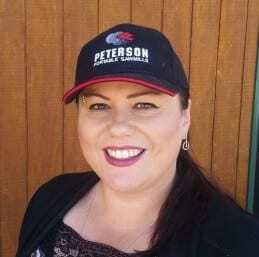 Layla has worked with the Peterson team since 2006 in various roles including demonstrating at trade shows in Australia and the USA. While in the office, she takes care of the Peterson website and social media, as well as staying in touch with mill owners through the email newsletter and assisting with quote requests. In her own time, Layla enjoys event planning with her focus being on planning fundraising events for local charities. Layla also loves hanging out with her son Dexter and her husband Robert, along with travel, concerts, music, movies and playing roller derby with the league she set up in 2011, the Sulphur City Steam Rollers. Maurice joined the Peterson team in 2018. He assists Layla in the Marketing department, helping with social media, keeping the website and CRM up-to-date, liaising with mill owners over various shows, writing marketing texts, designing flyers and other print documents. 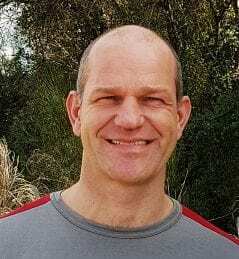 Originally from The Netherlands, Maurice moved to Rotorua from Auckland in 2016. 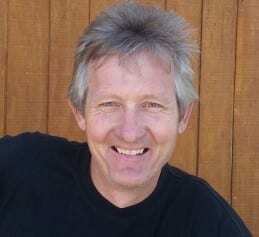 He is a keen runner and mountain biker, and enjoys nothing better than spending his time outdoors. He also enjoys trying his hand at new things (like playing the electric guitar and learning Spanish), keeping fit, going to the beach, and spending time with friends. Born and bred in Rotorua, Chris is a typical DIY Kiwi bloke who can fix anything. 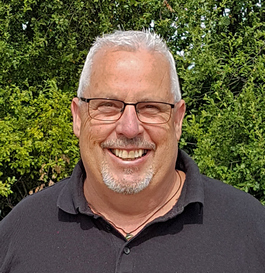 With a background in automotive engineering, heavy earth moving equipment, farming and manufacturing for Kilwell Sports, he has a great insight to the uses and practicalities of machinery for a purpose. When Kerris ‘discovered’ him at the age of 18 and invited him into the Peterson business, he fit in like a glove and promptly set to work making the machines more user-friendly, stronger, more reliable, and simpler to build. Chris enjoys attending shows with the mills, and takes to our Peterson owners fabulously well – he can often be found designing some new gizmo that an operator has asked for. In his spare time (yeah right!) he enjoys distance running, cycling, fishing, cruising on his motorbike, watching sport, or cutting up logs with his personal sawmill. Having been with us now since 2001 and promising to retire here, Pat lived in Auckland in his younger days where his brother-in-law got him into the manufacturing industry. Pat learned invaluable skills making supermarket freezers for McAlpines Hussman, and later welding freezer containers for Mitsubishi, where he gained his welding certificates. Since working with Petersons, Pat has picked up welding skills passed on by an earlier aircraft welder at Petersons and is now the senior welder himself. Pat takes great pride in completing all the finer detail welding on our sawmills. 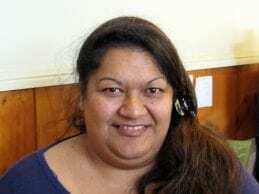 At home Pat has a lovely wife Tangi, daughters Nga and Reokore, and grand daughter Tanika Storm. Pat has 6 children in total and 10 grandkids, so comes to work for a break sometimes! In his spare time, he enjoys watching sports and supports any team from Auckland. A proper POM, Paul is from Birmingham in England. 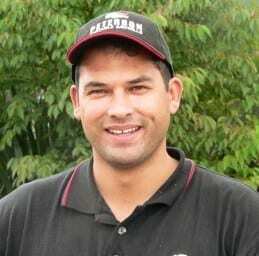 He came to NZ with his family on holiday in 2000, met Chris and Kerris, and immigrated in 2003. With a background in small part engineering and sign fitting, Paul has a great eye for detail and fine workmanship and really cares about the product the customer receives. He initially spent eight years with Petersons before temporarily trying out an alternative career. But Petersons were delighted when they managed to win him back in 2014 as Factory Foreman for good! In Paul’s spare time he enjoys a quiet drink on his deck overlooking the beach with his lovely wife Tracey. His two sons have now grown up and have careers of their own, but enjoy popping back to relax by the seaside with their dad! Ash worked in a number of industries before settling at Peterson’s in 2015. First he studied Hospitality, then worked at a Timber Mill, grading and finger-jointing timber. After a few years, he moved onto manufacturing plastics at Cryovac. Unfortunately, after seven years, the company relocated and Ash landed in our laps (lucky for us). At Peterson’s, Ash fits and turns the smaller mill components and puts the mills together. He also checks mill setup as part of quality control procedure before mills are shipped to customers. He married his wife, Kim, at the end of 2016. A year later, Ash and Kim and their four children moved into a custom-design Tiny House, located on Aria’s Farm.